Somewhere along the way, instead of looking forward to Thursday night because it was the start of the weekend party, I started looking forward to Friday night because it was the recuperation night after a long work week. This past Friday was no exception. Hubby went out to Happy Hour with his former coworkers, an adventure that always turns into a late night out, while I stayed home to watch some girly movies and pack for my girls’ weekend in Cincinnati. My friend Christine ran the Cincinnati Flying Pig Marathon (congrats Christine! ), and as it was her first marathon, 5 of us from different parts of the country met up with her husband to cheer her on. Since the weather was not going to cooperate and as I was heading straight from the airport to work on Monday morning, my night of packing also required doing a little laundry and, of course, opening a bottle of wine, because what is laundry and packing without good wine? 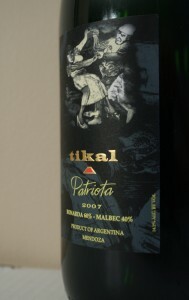 The 2007 Tikal Patriota (winery, snooth) was made with 60% Bonarda and 40% Malbec grapes and was a deep purplish ruby. On the nose, the wine was very complex, with blackberry jam, blueberry, nutmeg, dark chocolate, and cinnamon aromas followed by the slightest touch of fresh mint leaves. In the mouth, it was fully of berries and sweet spices. The wine had big tannins, strong acidity, and a nice body. Is this worth a glass after work? It’s worth more than one! What are you waiting for? 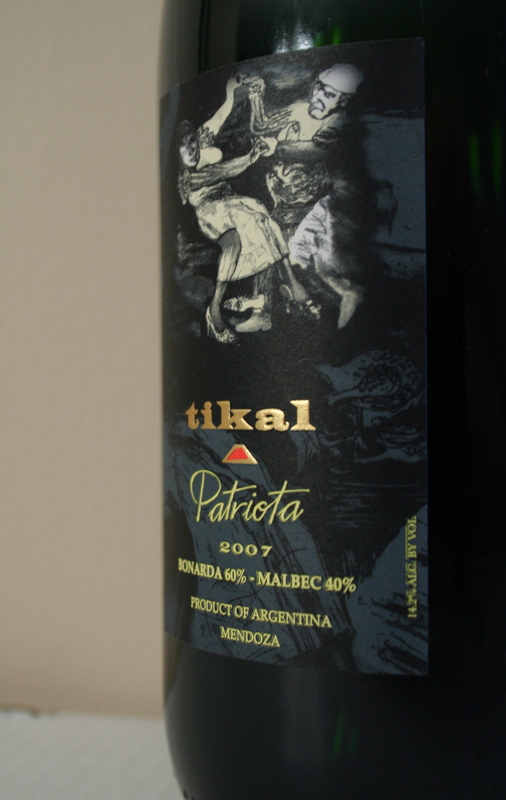 At $23, this Argentinian wine is surprisingly complex, yet easy to drink. The wine should definitely be decanted or go through an aerator, as it was a little tight; however, when it finally opened up, the Patriota was absolutely delicious. This wine is perfect for an evening where you want to just relax, talk, and drink wine, but also pairs beautiful with food, particularly foods with a higher acidity. Sounds incredible! I’ll definitely have to look for this one. Have a great weekend and best of luck to Christine! Mark–I admit, this one surprised me. I picked it up because I was interested in trying the Bonarda grape, and it definitely worked out well. Christine’s race went well, although it was a VERY wet weekend. Thanks for sending the good wishes. David–I’m glad to hear that you found A Glass After Work on DC Blogs. Restaurant Refugee has been a long-time reader, and I always appreciate his shout-outs. Hopefully, we’ll continue to see you around here! I have had this incredibly heavy bottle in my hands about 5 times! I am definitely moving it to the top of my list and am looking forward to giving it a try. I have heard nothing but good things about Tikal. Robert–it’s definitely worth moving to the top of your list, and I’d love to hear what you think of the wine once you have a chance to taste it. I finally got my hands on this wine. Looking forward! oooh…I can’t wait to hear what you think!